Something to see in Watchful Waiting. The Prostate and its Woes. The prostate gland often enlarges in older men and partially blocks the flow of urine. This results in a weak stream, getting up one or more times in the night to pee, and several other symptoms. The condition is called BPH, Benign Prostatic Hyperplasia or Prostate Enlargement. The word 'Benign' means that it's not Cancer. Set the phone down with the mic pointing towards the toilet. Press Start. Press Stop when you're finished. This will show a graph of this pee. Check out the composite graphs of all the pees from today. Scroll to view other days. 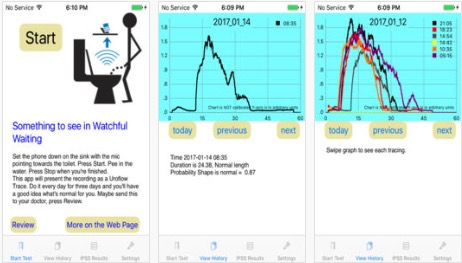 Purpose of the UroflowTracings app. The uroflow tracing is a common diagnostic test for the restriction due to Benign Prostatic Hyperplasia (BPH) or also for dysfunctional voiding in children. It measures the duration, hesitation and shape of the urination. It also provides a comparative view of the maximum flow (Q-Max) and the voided volume. A middle-aged to elderly man faces the question “Is it getting worse?” and that’s where this test comes into its own. He can test himself every six months and talk to his doctor. Or he can change his behaviours and drink less red wine and more tea for example, and then himself observe the objective changes in his urination. The goal here is to use the least medication and to avoid surgery. With children it’s a little different because the causes of dysfunctional voiding are different. Sometimes it’s a past trauma or a mis-training. The general approach for this is Biofeedback, essentially giving the child encouragement for success. If we can move the treatment mostly to the home with the parent giving the encouragement, the costs of the treatment diminish greatly, and maybe the duration of the treatment will be shorter too. The doctor can remain in the cycle, using the tele-medicine features of the app, he can view the tracings in his office as he discusses them with the parent.